There will always be a need for meeting space. Even in the age of virtual meetings and rapid proliferation of social media, business people are finding that they still need human contact with face-to-face interaction for bonding, engagement and relationship building. Face-to-face meetings allow participants to associate body language with what is being discussed in order to assimilate the whole message. Attendance at destination conferences reportedly dropped in more recent years due to the unstable economy. Conference planners now report their market is beginning to return with a pent-up demand for group professional education and networking experiences. Outside-the-office meeting space provides an opportunity for a fresh environment that may stimulate creative ideas, enable people to think freely and encourage interaction and dialogue among peers. While there's a massive industry (such as rentable corporate conference centers) providing meeting spaces outside of the hospitality industry, where better to schedule meetings than in a hotel? Hotels can provide the whole experience, from grand ballrooms, to meeting rooms to boardrooms. 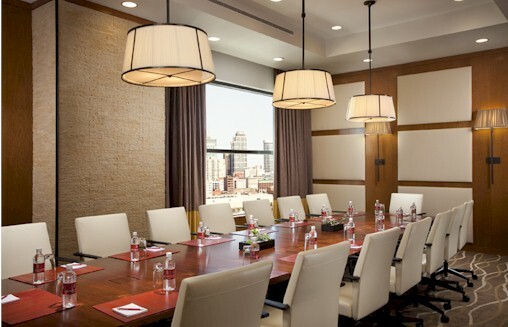 The 509.9-square-foot West End Boardroom of Hutton Hotel, a Nashville five-star boutique hotel, can accommodate 16 for a smaller meeting. The key for a hotel to earn a reputation as a successful meeting venue and to retain staying power hinges on flexibility to accommodate the meeting market.